Fascination with South Africa’s rock art heritage has drawn Victor Biggs to more than 2 000 sites over the past 60 years. Amongst this number, three sites, all in the Kei River catchment in the Eastern Cape’s Border region, are of particular historical interest. Mike Burgess accompanied Vic here to learn more. Victor Biggs photographing rock art. 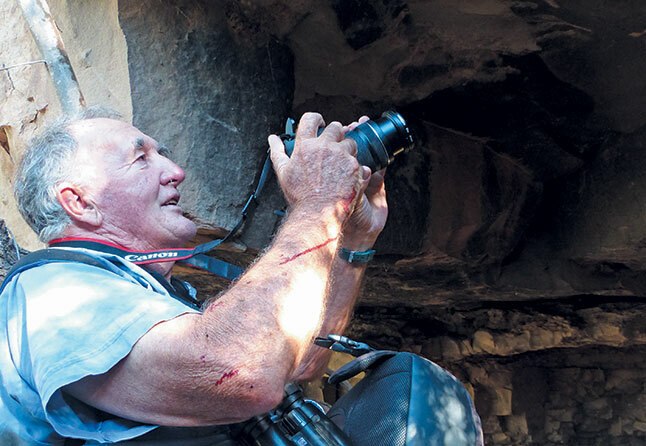 Victor Biggs (73) is a retired farmer who has spent most of his life finding and photographing rock art sites across South Africa. Here he discusses the history of the Kei River rock art. 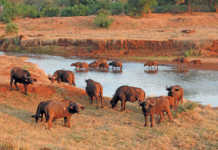 According to Vic, his three favourite art scenes, near the Xolobe, Waqu and White Kei rivers, are of particular importance to him as they document unique, localised historical events, and are situated in the Border region where he grew up along the banks of the Great Kei River on the farm, Gaikaford, near Bolo. Vic left the area as an adult, and, amongst other things, spent almost 15 years farming in the Matatiele district of Griqualand East. He returned to the region in 1979, and rekindled his passion for the rock art and history of the Kei River catchment. In 1991, Vic discovered a rock art painting depicting a Victorian lady, complete with elegant hat, in a former Transkei shelter. This discovery was a direct result of his interest in one of South Africa’s great 19th century rock art recorders, George Stow. Vic was first introduced to Stow’s works in Eric Rosenthal’s and AJH Goodwin’s book, Cave Artists of South Africa (1955), and as he delved deeper into the intrepid explorer, trader, geologist and rock art recorder’s life and works, he was captivated by its scope and significance. Between 1867 and 1882, Stow had copied over 170 rock art scenes in the Eastern Cape and Free State, a time during which the San were still ruthlessly persecuted and murdered. A close-up of the Victorian lady in the Xolobe River Valley shelter in the former Transkei. “It’s incredible that we were able to link Christina to the painting in the cave,’’ says Vic. The shelter in which Vic discovered the painting of the Victorian lady was the same shelter once visited by Stow. It was situated across the Great Kei from Gaikaford, where Vic’s grandfather, Robert Acton, had raised him after the sudden death of his father. The shelter was also relatively close to Khuse, where Acton had begun trading in the late 1800s. Vic recruited his cousin, Dave Acton, to assist him in finding Stow’s site near the Xolobe River. 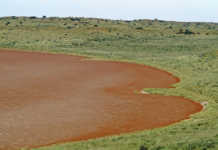 After driving to the former Transkei, Vic and Acton asked locals about possible rock art sites. Eventually, they encountered a man who assured them that there were paintings near his home in the Xolobe River Valley. “He took us down a steep incline and led us along a ledge to a big cave, and there we found the Stow paintings!’’ Vic recalls. The paintings had been damaged by livestock, but using Stow’s copies to compare the images, Vic was able to identify most. However, it was the painting of the Victorian lady, which was notably absent from Stow’s copies, that captured Vic’s imagination. When he returned to his farm, Haddon, near Kei Road, he immediately showed his mother, Francis, and his aunt, Joy, the photographs he had taken of the mysterious rock art painting. The two then related a little known piece of regional history that directly involved Robert Acton. “They told me about a white missionary lady who had lived up in the Xolobe area in the late 19th century,’’ recalls Vic. Joy also told Vic about WF Livingstone’s book, Christina Forsyth of Fingoland: The story of the loneliest woman in Africa, which detailed the life of Xolobe’s mysterious woman. He eventually located the book in the East London Museum, and was spellbound by its principal character, an intrepid Scotswoman, who on her arrival on the Cape’s Eastern Frontier in 1886, requested to be placed in as isolated an area as possible, in order to convert the most hardened of ‘heathens’. This ended up as a 29- year assignment that destroyed her health and will, and in 1915, she returned to Scotland where she died a few years later. “In the end, old age and hard living caught up with her,’’ says Vic. Considering his family’s account of Forsyth’s last days in the Xolobe area, Vic is convinced she suffered a nervous breakdown. He is equally certain that the rock art painting is a depiction of her, as she arrived in the area after Stow. In the early 1990s, Vic discovered a painting of soldiers in a rock shelter near the source of the Waqu River in the Cathcart district. The shelter was situated near the Moravian Mission station of Goshen, at the foot of the Windvogel Mountains, named after the 19th century San chief, Windvogel. Nevertheless, despite copious research and examinations by rock art enthusiasts and experts, nothing more could be learnt about the soldiers’ identities. In 2000, Mrs ‘Granny’ Nesbitt from Cathcart contacted Vic to purchase a copy of the photograph of the soldiers he had donated to the local museum. When she died in 2005, her grandson, Huen, who lived in the UK, returned to Cathcart to settle her estate, and asked Vic to guide him to the shelter containing the painted soldiers. On seeing the painting, he was as excited as Vic had been almost 15 years earlier, and promptly related a unique story about South Africa’s famous soldier, trader, hunter, geologist and road engineer, Andrew Geddes Bain. According to Nesbitt, Bain was the officer sporting a hackle in the line of painted soldiers. Margaret Lister, editor of Andrew Geddes Bain’s journals, was ‘Granny’ Nesbitt’s mother, and the story about Bain had been passed down from generation to generation. While Bain was hunting elephants in Bechuanaland (now Botswana) in the 1830s, his party was attacked by an impi of Mzilikazi’s Matabele. Having barely managed to escape on horseback, Bain lost all his wagons, cattle and equipment. Thus forced to return to Graaff- Reinet in the Eastern Cape Karoo, Bain secured a commission as an ensign to the Hottentot [Khoikhoi] levies shortly after the 5th Frontier War (1834/35). Stationed at Fort Thompson near Alice in today’s former Ciskei, Bain was tasked with handling the stock theft problem along the turbulent Eastern Frontier, and providing protection to displaced San, who were settling around an outstation of the Moravian Mission at Goshen. Because of the close proximity of Goshen to the shelter, both Vic and Nesbitt were convinced that the officer in the painting was Bain, depicted as overseeing an early morning parade of his Khoikhoi levies, who are clearly carrying their weapons. George Stow copied the rock art paintings of two sites along the White Kei River near the historic St Mark’s Anglican Mission in the former Transkei. One site depicted trekking springbok on a rock panel found in the cave of San chief, Madoor. According to Stow’s book, The Native Races of South Africa (published posthumously in 1905), Madoor was still living in the cave at the time that Archdeacon Henry Waters founded the mission in 1855. After Stow’s death in 1882, Lucy Lloyd, a linguist and ethnographer based in Cape Town, purchased Stow’s work from his widow. When Lloyd died in 1914, Stow’s work was inherited by her niece, Dorothea Bleek, who in 1930 published, with the support of the Carnegie Trust, Rock paintings in South Africa from parts of the Eastern Province and Orange Free State, in which 74 of Stow’s rock art painting copies appeared. 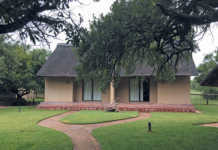 Of the 74, Bleek managed to find 60 in shelters and caves during a trip through the Eastern Cape and Free State in 1928. Interestingly, one of the Stow rock shelters that Bleek was unable to locate was Madoor’s cave, and she notes in her book that she had been told by a Mrs Bulwer, from the St Mark’s Mission, that numerous panels of rock art had been removed by members of the Cape Mounted Rifles shortly after the Final Frontier War of 1877/78. Assuming that Stow’s springbok had been removed, Dorothea left the White Kei empty-handed. In 2005, Vic discovered that Trappist Catholic monk and artist, Brother Otto Mäeder from the Marianhill Monastery near Pinetown in KwaZulu-Natal, had visited the Keiland’s Catholic Mission along the Kei River in 1913/14 with the mandate to copy rock art. Wondering if the monk had perhaps gone to the same sites visited by Stow decades earlier, Vic soon discovered that Brother Otto had copied not only Stow’s ‘lost’ springbok, but numerous other paintings along the White Kei. “I was then sure that the springbok were still along the White Kei, because they had been copied decades after they were supposedly removed by soldiers in the 1880s,’’ he says. While Vic had found another Stow site during his first visit to the St Mark’s area in 2005, Madoor’s cave eluded him. However, with characteristic determination, he returned months later, and this time walked up the White Kei towards a stone-arched bridge, completed two years before Stow’s death in 1882. Sure enough, just metres from the White Kei, an ecstatic Vic found a sizeable shelter with Stow’s ‘lost’ springbok. Phone Victor Biggs on 082 728 1245.